April 27, 2018, Kirkland, Washington, USA - Silicon Designs, Inc., a 100% veteran owned and U.S. based global industry leader in the design, development and manufacture of highly rugged industrial-grade MEMS variable capacitive accelerometer chips, modules and supporting data acquisition, today announced the recently enhanced performance of its compact, low-mass, single axis Model 2220 series. Design of the enhanced Model 2220 series incorporates Silicon Designs’ new proprietary high-performance MEMS chip, along with high-drive, low-impedance buffering, for industry-exclusive improved bias and scale factor over temperature performance. These specifications are unmatched among other industry MEMS VC accelerometer manufacturers yet are still offered by Silicon Designs at a highly competitive price point. The Model 2220 series is available in seven unique models, with standard measurement ranges from ±2 g to ±200 g, each with a wide frequency response measuring down to zero hertz. Each accelerometer module is housed within an epoxy-sealed rugged anodized aluminum housing, with mounting via two M3 screws. Its lower mass (10 g) and compact size (1" x 1" x 0.3") can help to minimize mass loading effects, making it ideal for zero-to-medium frequency acceleration and vibration measurements within a variety of industrial and commercial applications. The Silicon Designs Model 2220 series can respond to both DC and AC acceleration, either with two analog ±4V (differential); or 0.5 to 4.5V (single-ended) outputs that vary with acceleration. At zero acceleration, differential voltage output is nominally 0 VDC (DC response), with typical 1% cross-axis sensitivity. Onboard voltage regulation minimizes supply variation effects. Units are designed to withstand shock inputs of up to 2000 g over a standard temperature range of –55°C to +125°C. Each module is serialized for traceability and calibrated prior to factory shipment. All of Silicon Designs MEMS variable capacitive accelerometers and chips are 100% designed, manufactured, and tested at the company’s state-of-the-art facility in Kirkland, Washington, USA. This includes the manufacture of the chips and dies themselves. The completely vertically integrated manufacturing processes of Silicon Designs allow the company to offer high-quality products at still-highly competitive pricing, along with some of the industry’s shortest lead times. Standard model quantities can typically ship in less than two weeks. 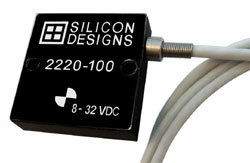 Silicon Designs was founded in 1983, with the goal of improving the accepted design standard for MEMS capacitive accelerometers. At that time, industrial-grade accelerometers on the market were bulky, highly fragile and costly. The engineering team at Silicon Designs listened to the needs of customers who required more compact, sensitive, rugged and reasonably priced accelerometer modules and chips that also offered higher performance. Resultant product lines were designed and built to surpass customer expectations. The company has grown steadily over the years, though its core competency remains accelerometers, with the business philosophy of “Make it better, stronger, smaller and less expensive” maintained to this day.